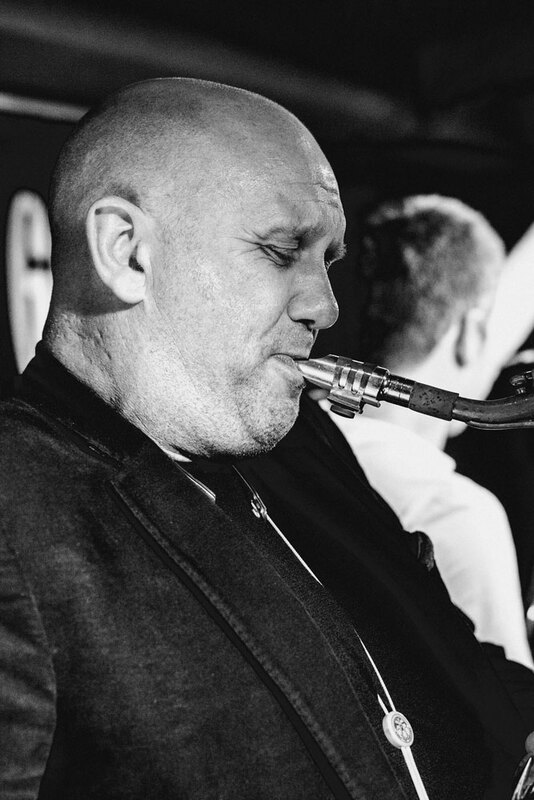 Rob is a fantastic saxophone player (both tenor and bari) and brings a wonderful warm, soulful and funky style to the band. Always impeccably dressed he always delivers a rock solid, ’rootsy’ and grounded feel to the band both off and on stage. His career as a jazz musician started whilst the was studying graphic design at Art school in Bristol. He has since performed and recorded with artists like Rufus Wainwright, Roxy Music’s Bryan Ferry, the Humphrey Lyttelton Band, a long stint with the Pasadena Roof Orchestra, The Echoes of Ellington, the BBC Big Band and his own Gerry Mulligan Concert Jazz Band, as well as plenty of film sessions. He also recorded an album of Al Cohn & Zoot Sims tunes entitled ‘Brandy & Beer’ with fellow sax player Karen Sharp.